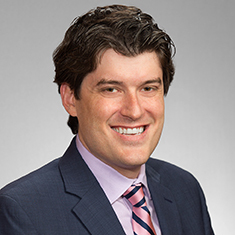 Ryan Meyer is an associate in the firm's White Collar, Investigations and Compliance group. He focuses his practice on conducting and defending investigations into alleged securities fraud, healthcare fraud, the Anti-Kickback Statute (AKS), the Foreign Corrupt Practices Act (FCPA) and the False Claims Act (FCA). Ryan works with companies and executives in government investigations and enforcement actions involving allegations of securities and accounting fraud, Medicaid and Medicare fraud, bribery, kickback and corruption, as well as qui tam suits alleging violations of federal and state civil false claims acts. Ryan has assisted in defending clients before federal and state agencies, including the Department of Justice (DOJ), the Federal Bureau of Investigation (FBI), the Securities and Exchange Commission (SEC), the Health & Human Services Office of Inspector General (HHS OIG), the Food and Drug Administration (FDA), the United States Department of Defense (DOD), the United States Secret Service (USSS), the Federal Trade Commission (FTC), and state attorneys general and state securities boards. Prior to joining Katten, Ryan served as a law clerk for Chief Judge Ricardo H. Hinojosa of the Southern District of Texas and as an associate at a large Texas law firm. While at a prior firm, assistance with the successful defense of a physician-owned medical practice in connection with a criminal investigation involving allegations of health care fraud, tax fraud, and wire and mail fraud. While at a prior firm, assistance with the successful defense of a provider-owned dental practice in connection with a qui tam Federal False Claims Act whistleblower lawsuit and parallel federal criminal and civil investigations. While at a prior firm, assistance in the representation of a publicly traded real estate investment fund in connection with an SEC investigation and a parallel DOJ criminal investigation. While at a prior firm, assistance to multiple individuals and companies in defending various SEC accounting and asset valuation investigations. While at a prior firm, assistance in the defense of numerous companies and individuals in connection with federal and state whistleblower lawsuits and resulting civil and criminal investigations conducted by HHS-OIG, the FBI, the FDA, US Attorneys' Offices, and state Medicaid officials. While at a prior firm, assistance in the representation of health care providers and DME/pharma interests in Anti-Kickback, Stark Act, and False Claims Act civil and criminal investigations and cases. While at a prior firm, assistance in an internal investigation of a large insurance-benefits manager to determine the source and scope of a potential data breach, as well as in the implementation of remedial measures.